SCANDIA UPDATE: At Scandia, we will be getting the fabulous group rate of $15.75 (!) for the unlimited rides/golf/10 tokens for arcade/batting cages wristband. Talk about a great deal! 1:30 PM: Meet at the entrance of FUNDERLAND at Sacramento’s William Land Park (see website link, below). A brief presentation of the history of the park followed by rides on the park’s attractions (all rides are $1.95 each for all ages, and we will also be linking you to an offer for a discount ticket book prior to May 31st), a lunch break (in-park combo meals are $7 or less, including drink), and a group photo at 3:30 pm at the Dragon Coaster. 5:00 PM: Meet at the entrance of SCANDIA FAMILY FUN CENTER, a 20-minute drive from Funderland. A brief presentation of the history of the park and a construction update on the park’s new coaster, followed by purchasing unlimited ride and mini-golf wristbands (at a to-be-announced group rate of $18 or less), a dinner break, an evening of mini-golf and unlimited rides on the park’s attractions, and a group photo at 8:00 pm at the new coaster’s construction site. The park and its attractions are open until 12 Midnight! NOTE: WHILE THERE IS NO ADVANCE REGISTRATION OR PAYMENT REQUIRED, WE DO ASK THAT YOU RSVP BY 12 MIDNIGHT THURSDAY, MAY 29th SO THAT WE CAN KNOW HOW MANY WILL ATTEND. PLEASE DO SO TO EITHER STEVEN WILSON (sww@sbcglobal.net) or GERRY WATT (flyingcoaster@yahoo.com). You will not be prevented from attending the event if you don’t RSVP, but please do! We will meet at Funderland in Sacramento’s beautiful and historic William Land Park at 1:30 PM. The popular Fairytale Town, Sacramento Zoo, and Pony Ride attractions, all mainstay park attractions along with Funderland for decades, are right across the street from Funderland, in case you would like to arrive early and visit any of those attractions prior to our event. All open their doors between 9 a.m. and 10 a.m. that day. Funderland offers nine rides–most are rideable by all ages (some restrictions apply such as height/weight), including a beautifully-landscaped Dragon Coaster (coaster credit! ), relaxing Log Ride, unique and compact Spinning Tea Cup ride, Vintage Car ride, gorgeous full-sized Carousel, Airplane ride, and Miniature Train ride that surrounds the park. Tickets for each ride are $1.95 (one ticket per ride for all ages), and we will also be sending you a savings coupon that gives a deal on books of 10, which are normally $16.95. There is a snack bar in Funderland, with the usual park offerings: hamburgers/cheeseburgers, corn dogs, chicken tenders, nachos and chili nachos, with combos available that include a drink and your choice of carrots, fries, or chips. Combos run from $6.25 to $6.75. All items are also available a la carte. Within walking distance across the street there is also a La Bou restaurant, a popular locally-owned Asian restaurant, and a Sprout’s Farmer’s Market that features a deli with made-to-order sandwiches and prepared foods to-go, plus a fresh produce section that will knock your socks off. There are plenty of tree-shaded grassy areas, benches and picnic tables right next to Funderland to socialize and relax at as well. We will meet at the Funderland Main Gate for a formal introduction to the park at 1:30 pm, followed by informal ride, lunch, and socializing time and a group picture at 3:30 pm at the Dragon Coaster. Sacramento’s family-friendly amusement park located in Land Park. From rides to parties, we’ve been dishing up kid-sized thrills since 1946! Visit us soon. We will then drive to Scandia to meet at 5:00 pm. A formal welcome and introduction to the park (and its new Coaster under construction!) will happen in front of the main entrance to the Arcade at 5:15 pm. We will then coordinate purchasing our unlimited ride and mini-golf wristbands for a to-be-announced group discount rate ($18 or less), followed by a dinner break. We are planning a group dinner at a popular Mexican restaurant within walking distance of Scandia, and we hope you’ll all join us, however there is plenty of nearby, diverse cuisine if you prefer (see the complete list of restaurants at the end of this email). There is a snack bar at Scandia with pizza, hot dogs and corn dogs, as well as 7 diverse restaurants within walking distance (including a Denny’s and Jack-in-the Box) and 6 more within a very short drive (including In-N-Out Burger and Boston Market). 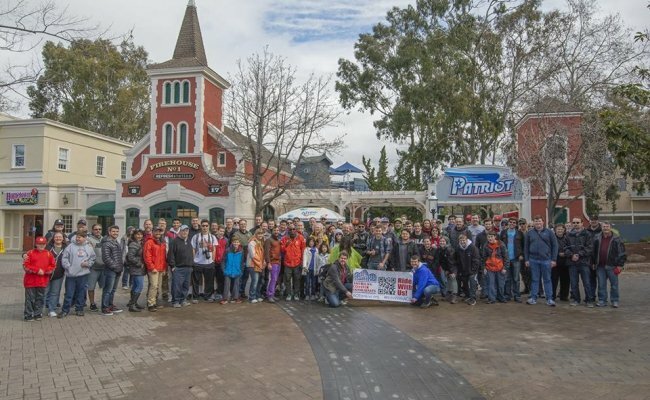 We will meet back at Scandia at 6:30 pm, with time for unlimited rides on Scandia’s 6 exciting attractions (the infamous 150-foot-tall Sky Screamer, new Norway Flyer, a Scrambler, Super Slide, Bumper Boats and Go-Kart Raceway, as well as unlimited miniature golf on their two picturesque and clever courses). Batting cages and an extensive Arcade are also available at additional cost. We will meet for a group picture at 8:00 pm in front of the new Wild Mouse construction site. Scandia and its rides and attractions are open until 12 Midnight! Some additional exciting news: Scandia has told us that ACE NorCal members will be invited back to participate in their formal grand opening of the new Wild Mouse sometime this Summer! We hope to see you Saturday, May 31st! Please do RSVP if you plan to attend the event, to either Steven Wilson at sww@sbcglobal.net or Gerry Watt at flyingcoaster@yahoo.com by 12 Midnight on Thursday, May 29th. You can still attend the event if you don’t RSVP, but please do so we know how many to expect. Thanks!